From the revolutions of Tunisia and Egypt and the Arab world uprisings in the spring (Bahrain, Yemen, Syria), to the devastating Japan earthquake and the recent British riots, citizen media has not only reported on many of the past year's major news stories, but also been integral to some stories themselves. Global Voices is proud to be partnering with Ashoka Changemakers this year in its ‘Citizen Media: A Global Innovation Competition‘, which is supported by Google. With prizes including US $5,000 grants for citizen media projects, if making a difference through media is what you're about, we want to hear from you. It's clear the kind of grassroots power that citizen media is capable of, but many around the world – particularly in developing countries and marginalised communities – do not have access to the technology that makes online participation possible. Censorship too, is threatening peoples’ access to citizen and social media platforms, as governments and other authorities recognise the part that these tools can play in mobilising social movements and activism. 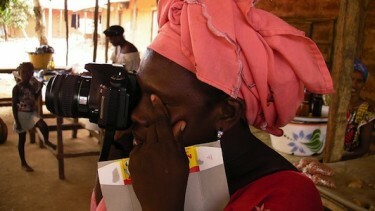 Citizen media in Guinea Bissau. Image by Rising Voices on Flickr (CC BY-NC-SA 2.0). Regardless of these challenges, innovators around the world are still managing to produce citizen media and engage online about the issues that affect them and their communities. Ashoka is a global organisation that since 1980 has been investing in leading social entrepreneurs – individuals with innovative and practical ideas for solving social problems. Their Changemakers project is a global online community engaged in supporting social change work through community collaboration and mentoring. The competition is open to people around the world who are transforming the way people communicate or access news and information. Winners can look forward to receiving one of four US $5,000 cash prizes in unrestricted funding to boost their projects, plus you could also be considered for an Ashoka Fellowship, which comes with a three-year living stipend and access to a network of social entrepreneurs. Entry is easy – watch this video or see the step-by-step instructions here and get it in before September 14, 2011. Entries can be submitted in the following languages: English, French, Spanish, Portuguese, Arabic, Thai, Indonesian, Mandarin, or Japanese. You don't have to be using the Internet – the competition is open to ideas that work with any communication or information technologies. Find out more about access to citizen media from Global Voices’ Co-Founder Ethan Zuckerman, in his interview with Changemakers below, or check out our citizen media outreach projects on Rising Voices. We may look back on 2011 as the year that citizen media changed the world.